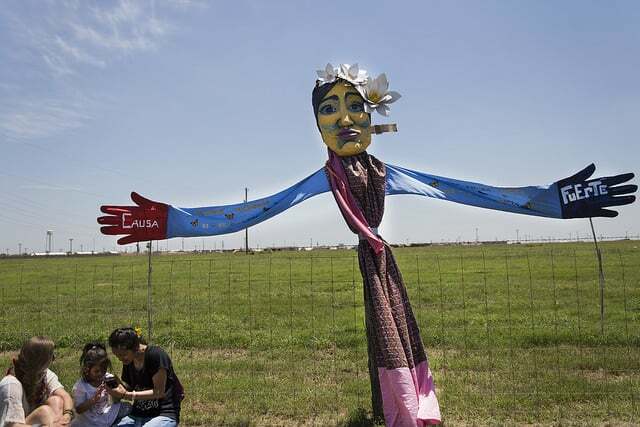 Giant puppet in front of Dilley family detention center, run by CCA, Corrections Corporation of America for Immigration & Customs Enforcement (ICE). Immigration and Customs Enforcement (ICE) is striking deals with private prison companies to lock up a “guaranteed minimum” of mothers with their children in euphemistically-termed family detention centers. The 2009 congressional mandate for Immigration and Customs Enforcement (ICE) to keep a minimum of 34,000 people minimum locked up at any given time is already well-established. But a new report by the Center for Constitutional Rights and Detention Watch Network reveals that this federal quota rests, in part, on aggressive deals with companies in the business of locking up families. According to the investigation, which based its findings on documents obtained through Freedom of Information Act requests, such local quotas are “even more widespread than previously reported, covering at least 24 detention facility contracts,” accounting for at least 12,821 of the 34,000 beds established by the national quota. Ninety-three percent of those beds are in privately-run detention facilities. Critically, such arrangements are confirmed in two of the three remaining “family detention center” contracts in the United States: the Karnes County Residential Center in Texas and the Berks Family Residential Center in Pennsylvania. Since 2014, the mass detention of families in these prison-like facilities has been a foundation of the Obama administration’s immigration policies toward refugees from Central America, many of whom are fleeing violence and poverty worsened by U.S. policies. The human rights violations at these camps have been condemned by human rights organizations and the bipartisan U.S. Commission on Civil Rights, and some have compared them to Japanese internment camps. Karnes, in particular, has been the site of repeated hunger strikes overinhumane conditions, including nearly free labor, lack of legal representation and contaminated drinking water. In 2014, some women detained at the prisonalleged that guards sexually assaulted them. According to the report’s authors, numerous questions remain. “Due to ICE’s lack of transparency and the resulting unavailability of data, it is currently unclear what percentage of detention facilities are subject to guaranteed minimums, what the costs of guaranteed minimums are, and the degree to which they influence ICE’s practices in controlling the pipeline into and out of detention,” they write. Yet, one thing is clear: profits are soaring for GEO Group and CCA, the two largest private prison companies in the United States. Both boasted to their shareholders recently that revenues are spiking, thanks in part to the windfall from locking up families. This entry was posted in Current News and tagged CCA, Domestic Issues, ICE, Immigration and Customs Enforcement, Prison Industrial Complex by TD Daniell. Bookmark the permalink.